Maker's Mark is quite important for Laphroaig, for the simple reason that Laphroaig is matured in Maker's Mark Bourbon barrels. 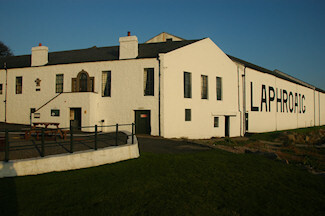 Another reason to hold the event in the US is to cater for the rather big American market, quite important for Laphroaig. While that means an evening event (25/Sep/2009 at 20:00 hrs / 8:00 pm Eastern Time) for them it means it will be rather late in the evening (or better very early in the morning?) for those of us here in good old Europe. I believe that means 1:00 am on Saturday in the UK, but don't quote me on that. Now the most important bit, how to attend it online. It will be transmitted on the Distillery Live 2009 - Laphroaig live from Maker's Mark Distillery website (which as of writing this shows a countdown to the event). This years guest host will be John Hansell of Malt Advocate, together with Kevin Smith from Maker's Mark and of course Laphroaig's John Campbell.